Two of the aims of the Raptor Foundation are to provide medical care for injured raptors and return rehabilitated birds back into the wild. 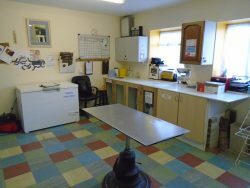 The centres on-site hospital is equipped to deal with the many birds that are admitted during the course of the year. On average, over 150 sick and injured birds have been treated over that period. 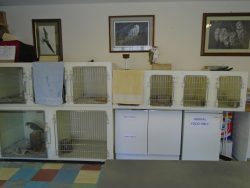 The hospital is run by staff trained in emergency aid and after care, with a specialist avian vet on call when needed. Due to the expertise needed when treating birds of prey, birds are taken to a veterinary practise 60 miles away. The hospital treats a wide variety of injuries and illnesses that include broken bones, infections, diseases and malnutrition. It also cares for babies and juveniles that have been left orphaned both in the nest and away from the nest site. For whatever reason a bird is brought into the hospital, the aim of the foundation is to introduce that bird back into the wild at the earliest possible opportunity. The success rate for orphaned juveniles is extremely high, but for the sick and injured that success rate is very much governed by the nature of the complaint, and tends to be lower. Casualties are brought into the hospital from a variety of different sources. The majority come from members of the public who find these birds while out and about in the countryside or driving around country roads. The centre will also go out and rescue birds seen by the public in distress, as well as offering help and advice to veterinary practises who don’t have the facilities or expertise to deal with these birds on a long-term basis. When a bird is brought to the hospital it will be admitted, then assessed for whatever injuries or illnesses it may have. Many of the problems are treatable by the hospital staff, using techniques in which they have been trained. Injuries and problems that are not treatable by staff are taken immediately to the vets for more specialised treatment and care. Once those birds have been treated either by staff at the centre, or the vet, they remain at the centre for their on-going care and rehabilitation. The hospital sees many different species of bird of prey. Some more frequent than others, with injuries more common than others. Barn owls, tawny owls, little owls, kestrels, sparrowhawks and buzzards tend to be the more common, with long and short-eared owls, red kites, harriers and other falcon species much less common. Road traffic accidents tend to provide a high number of casualties to the hospital, with many injuries so severe they are un-treatable. Malnutrition is another cause of high admissions, especially during periods of extremely wet or cold weather. Conditions where birds are unable to find food and become very weak in a very short space of time. For them, it is just a matter of feeding them back up to a more normal body weight and releasing them back. The centre encourages members of the public to help with the release of the rehabilitated birds, they have found, back into the wild. In many cases it is just a matter of taking birds back to where they were found and releasing them. With orphaned birds, and those who have undergone a long process of rehabilitation, the release is not quite so easy, and is therefore carried out by staff, with often the help of outside organisations like the British Trust for Ornithology. Whichever method is used, the centre will always ensure the bird receives the best possible chance of a successful future back in the wild. As well as dealing with the many injured birds brought in from the wild, the hospital also deals with issues arising from the 150 plus birds permanently residing at the centre. Regular health checks, for example worming, spraying for mites, etc are carried out twice a year, as well as dealing with any emergencies that can occur at any time. 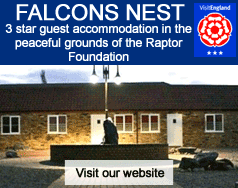 As a charity, the hospital does not receive any financial help other than the money raised by the centre and by the Friends of The Raptor Foundation. Veterinary fees, and medications, are costly, as the hospital will always give the best care possible to every bird admitted. Any donation given for the medical care of the birds will be used wisely, and will be very much appreciated. Follow our news reports to find out more about our successful releases and the work carried out in the hospital.